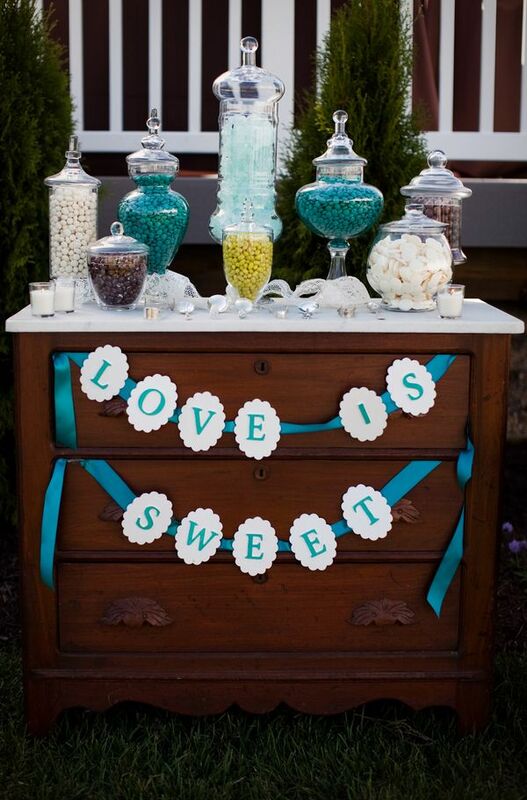 Wedding candy buffets have become incredibly popular. 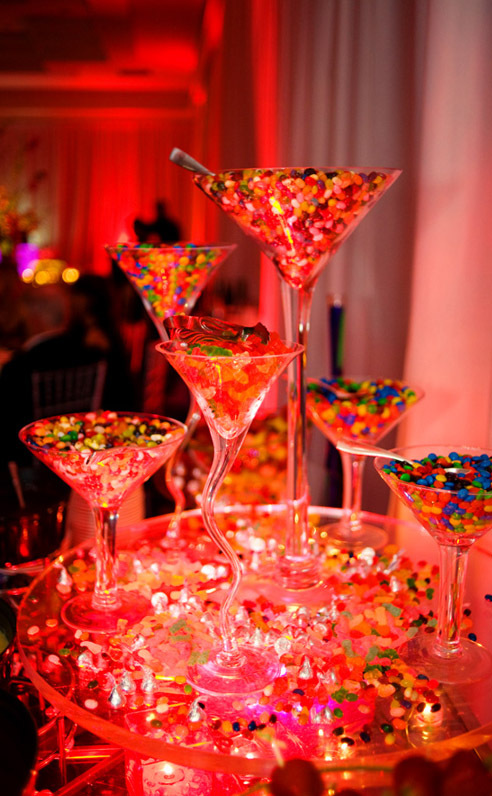 From lighting to custom-made candies, candy bars offer all sort of potential for presentation. The best advice we can give is to make it uniquely yours. Use your own personal inspiration and add new ideas to create a display that creatively reflects the story of your wedding. 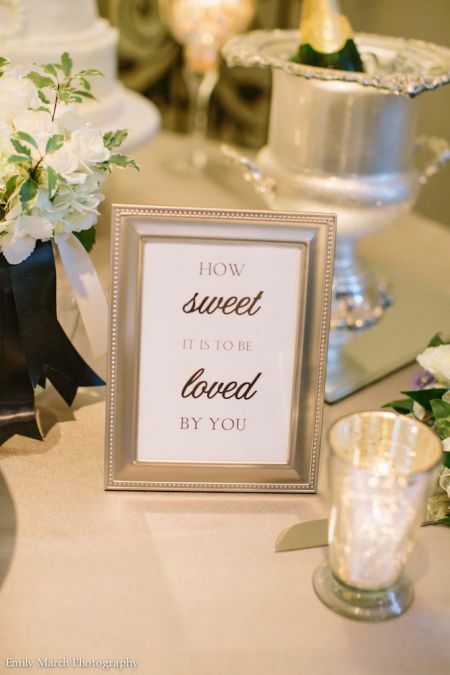 Anything can be the inspiration-color, pattern, texture, sparkle, theme, or anything that is symbolic or makes the display feel very personal to the couple. 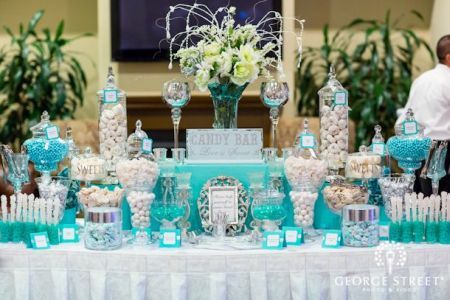 Everyone loves candy and here you will find ideas that are different and edgy to help give you a visual sense of how sweet it is to create a stunning candy buffet. 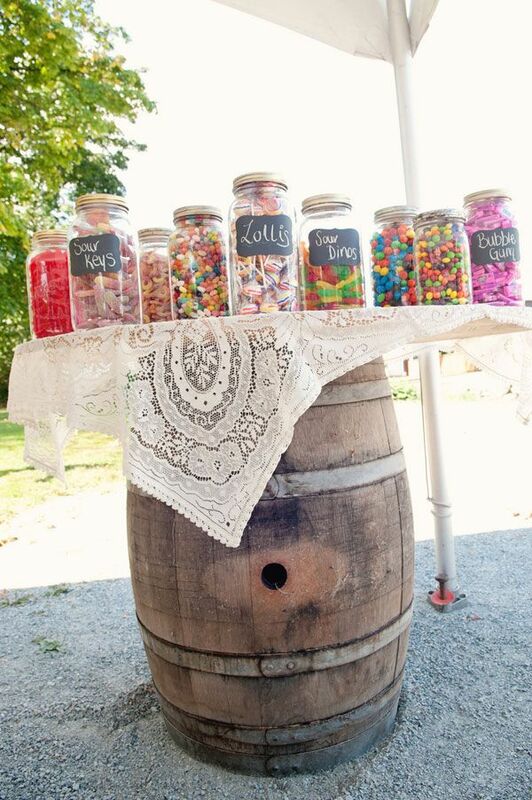 The power of presentation is vitally important when building a wedding candy buffet. There are no limits or requirements, so make choices that are special and meaningful to you. 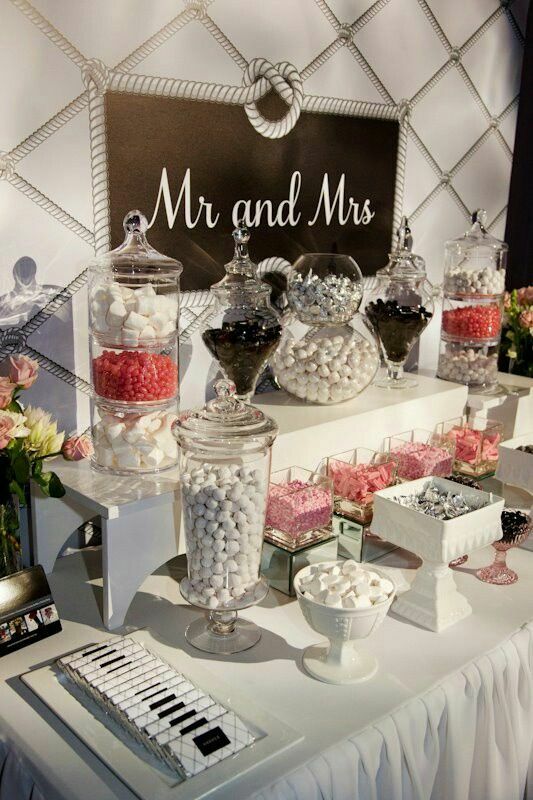 Since the candy bar display can play a major role in the reception area, the design should visually express the theme of the wedding. 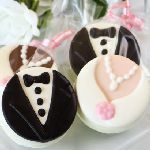 We love some of these ideas that make a big statement with one color, no color, or define the theme in a delicious way. 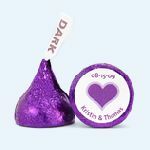 This display is your chance to infuse some fun, color, and sweetness into your wedding favors. It boasts big pops of yellow and a mix and match of elements that complement each other in an irresistible way. The deliciousness of decorating with white lies in its simplicity and its timeless perfection. 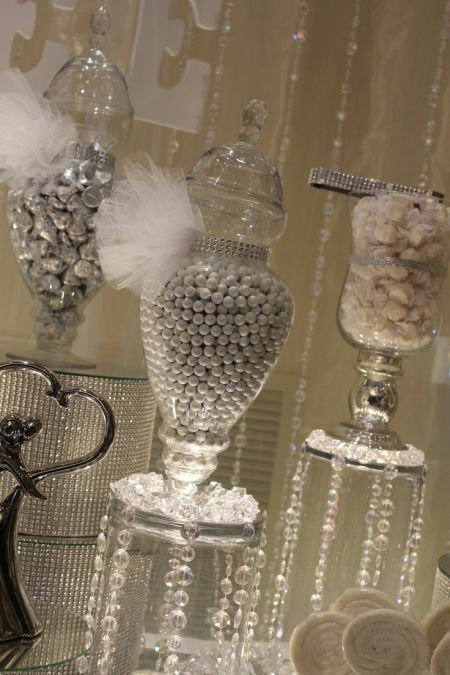 The shiny favor boxes and crystals reflect light easily and add sparkle and glamour to the table. 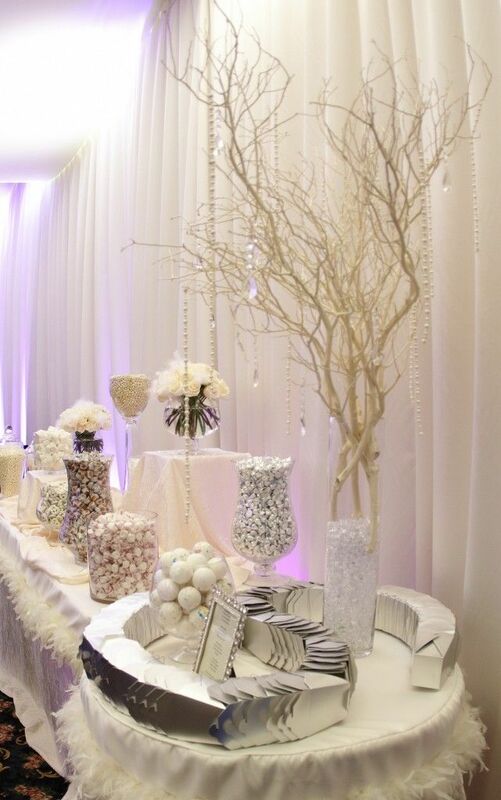 The serenity and purity of an all white candy buffet is shown off beautifully here. 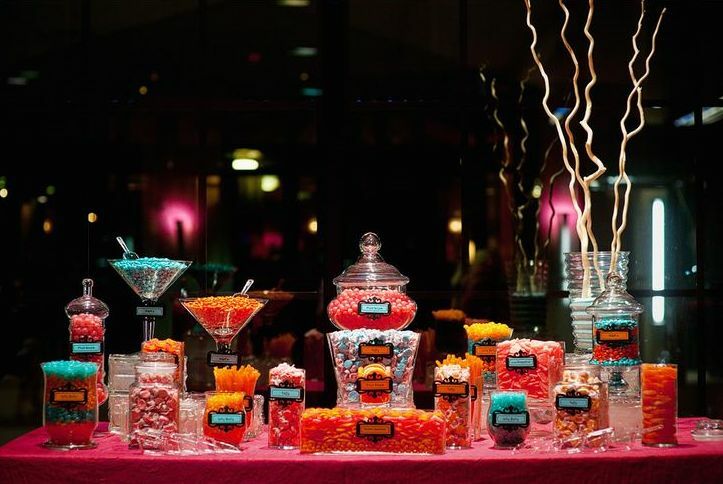 This wedding candy buffet uses a wide array of bright and happy colors to set the mood for fun. Such an exceptional display as this calls for equally fun-loving guests to enjoy it. Using white as an accent against the overall blue color scheme, gives this buffet an updated twist. The color provides the visual interest, while the white provides a backdrop that accentuates the color. Flowers set the scene like nothing else can. 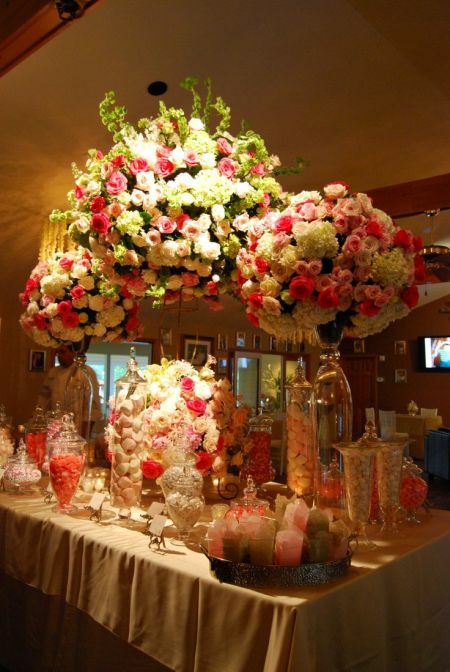 This beautiful floral display is the perfect blend of elegance, imagination, and allure making this wedding candy buffet unforgettable. Flowers make people happy-plain and simple. The power of crystal clear. This display has a sense of formality and a sense of grandeur. The most awe inspiring feature is the centerpiece, contributing as much to the ambiance as the soft, romantic lights floating throughout the wedding candy buffet. Outdoor scenery provides a beautiful background, but going one step further with creative lighting makes it visually spectacular. The tree commands your attention initially with flowering branches and tealights tucked into suspended glass pots for extra atmosphere. Nothing transforms a space like lighting. 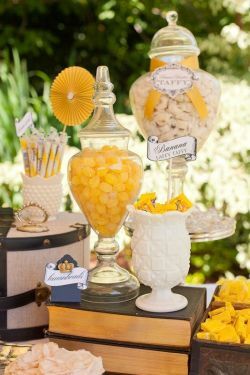 This wedding candy buffet will inspire you to combine vintage pieces with wedded bliss to create a stylish and inviting display. The brightly colored picture frames bring a pop of color in an unexpected way. 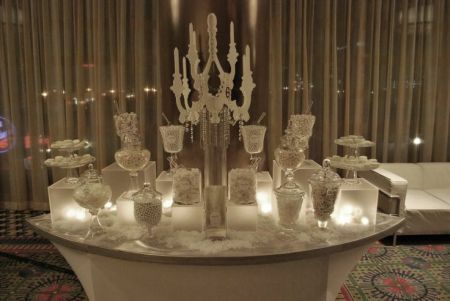 This wedding candy buffet displays all things silver and white. The bling is announced by tulle, crystals, and sparkles that demand attention. 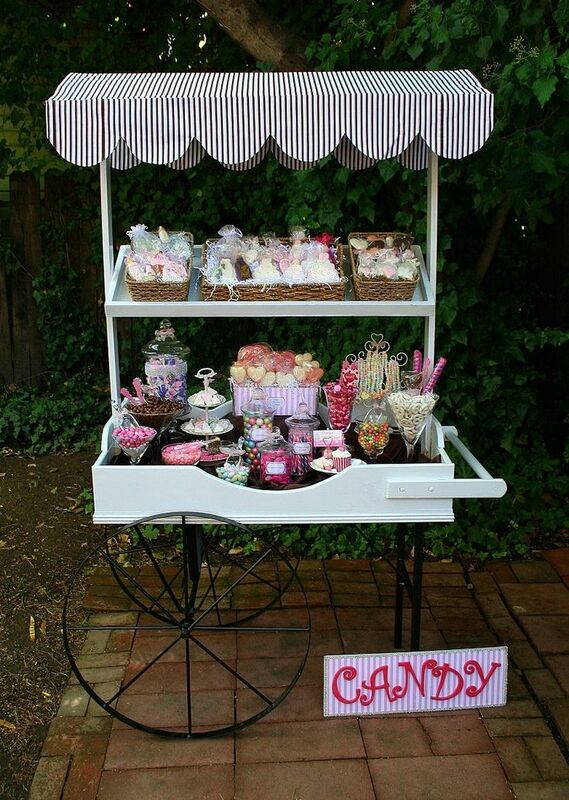 A grand gesture appropriate for a candy buffet of luxurious proportions. The power of personal style. 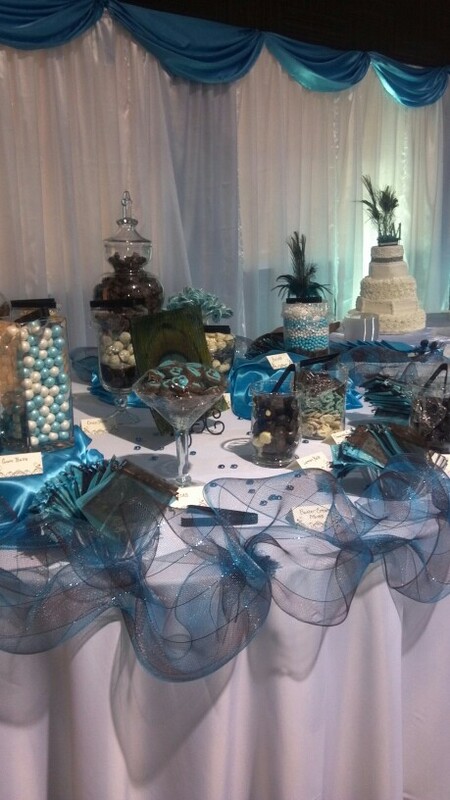 Today's candy buffets are individual works of art. Brides want every aspect to reflect their own unique style. 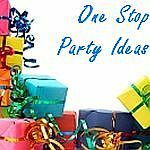 There simply is no cookie-cutter candy buffet. We love the individual stamp and personal touches of this display. The power of a chandelier. The element of the unexpected is perhaps the most intriguing touch of all. 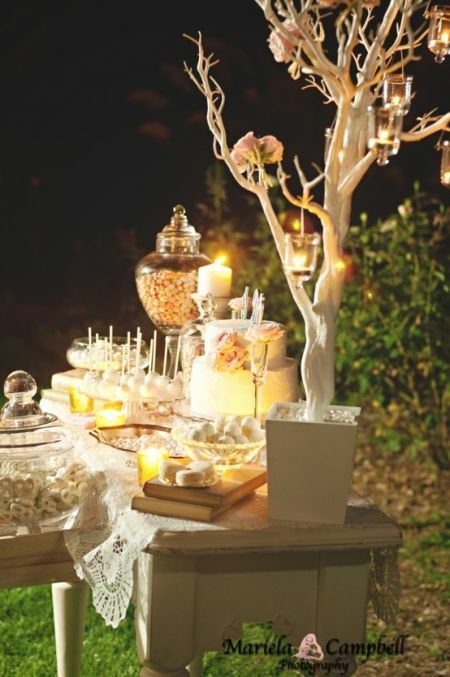 This wedding candy buffet employs the use of a beautiful chandelier to bring romantic lighting to natural surroundings. 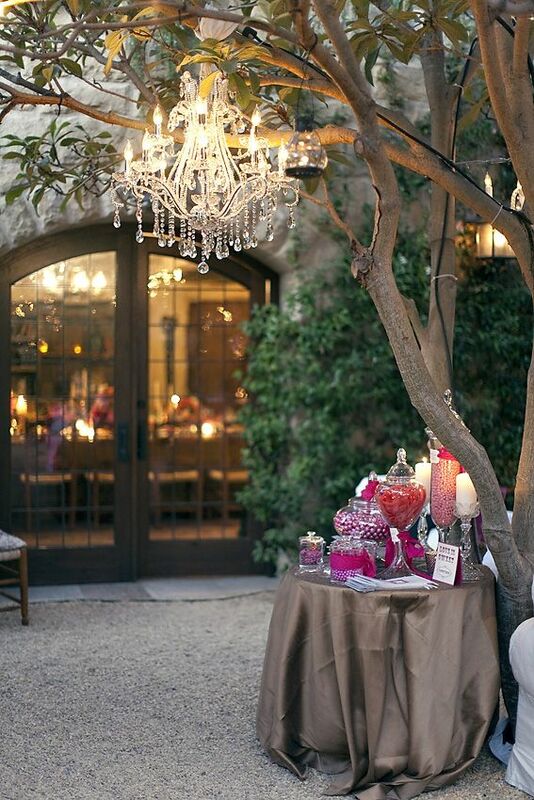 The lit chandeliers, which can be rented, create a blush glow. The power of color schemes. The aim of this presentation is to capture the magic of color throughout the space. The vivid blue touches of the drapery toppers spill throughout the tablescape from the candy to the distinctive ribbon surrounding the edges of the table. 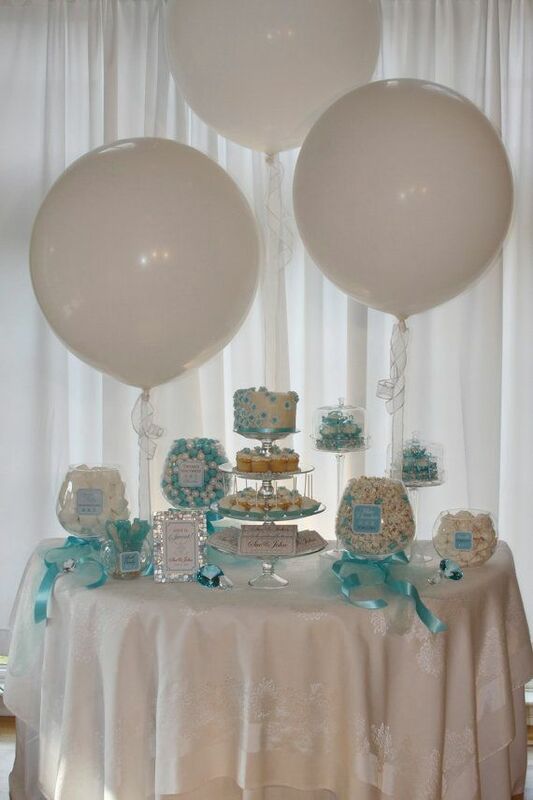 Dominating the table are large balloons combined with traditional candy. There is something about the simplicity of this design that creates an ambiance that evokes a happy feeling. 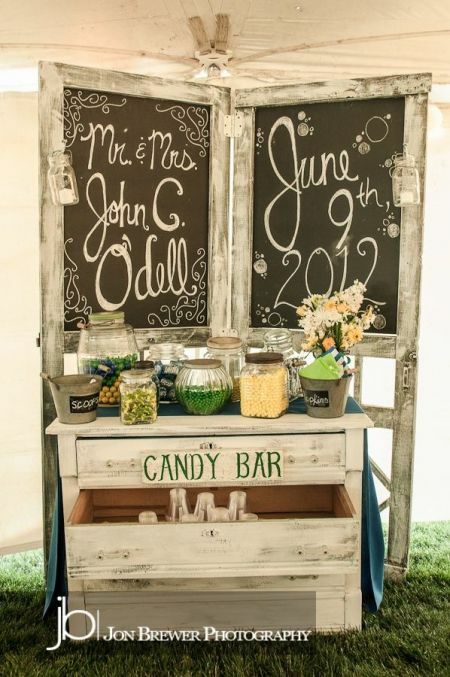 In this wedding candy buffet, the hanging initial, burlap accents, and neutral color scheme are naturally expressed in a unique way. 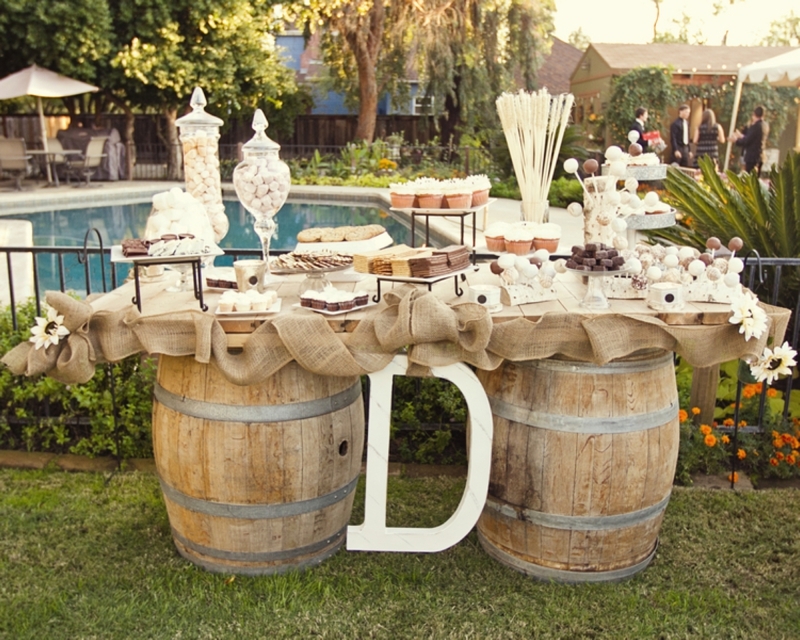 We love the creativity of using barrels as the base of the table. 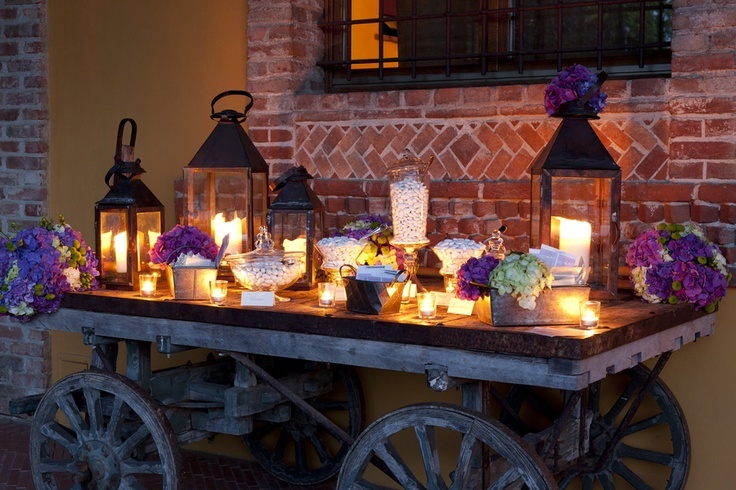 Lanterns look especially appropriate atop this old rustic wooden wagon. 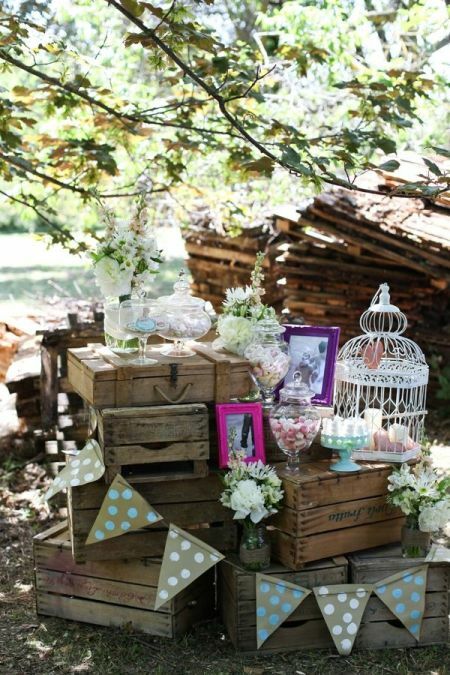 Casting soft light over the candy display, lanterns add a whimsical touch that this setting demands. Sleek, stark, and sophisticated, this is a dramatic presentation for the most glamorous array of guests. Colorful candies become art in this glorious showcase of light. 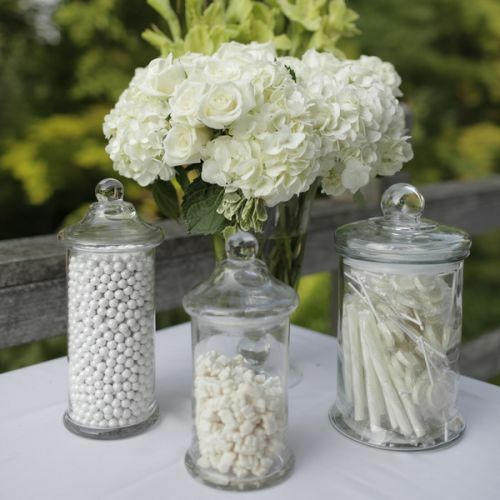 Opt for a whimsical, white cart to display your wedding favors. 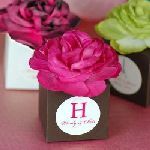 With the right balance of color and an array of sweet treats, this is a fun way to say thank you.